A recap of Nielsen’s keynote presentation at CiderCon 2019 in Chicago. For the last three years we’ve been honored to have our partners at Nielsen present on the state of the cider industry during CiderCon’s opening session. They offer many of our members individual services, but we work with Nielsen to bring our members broad analysis that can help you with business pursuits and decisions. We are grateful for our partnership with Nielsen, and we hope that you will make sure you’ve sent them your labels and UPCs to enhance the value of this partnership. We wanted to give you a quick recap of the points they delivered a week ago today. You can download their slides here: Nielsen Pres’n at CiderCon 2019_2-7-2019. Total off-premise (aka retail) sales were up 8.4% for the cider category in 2018. The category did over $500 million in off-premise sales last year. Cider retail sales dollars are 10x bigger today than 10 years ago. 40% of cider drinkers are between the ages of 21 and 29. Cider is the most gender balanced alcohol category, with 51% of drinkers being male and 49% of drinkers being female. Cider grew faster than beer, wine or spirits last year. Cider was edged out by Flavored Malt Beverage (FMB) growth, however. Cider is growing, but is still less that 1% of alcoholic beverage market share. The National Beer Wholesaler Association’s “Beer Purchasing Index” survey shows cider is an expanding segment with respect to distributor purchasing orders. Cider conversations online grew 11%–more than craft beer and alcoholic beverage category as a whole. Cider’s growth was led by nationally distributed rosé ciders (chiefly Angry Orchard and Crispin) and by regional/local brands. 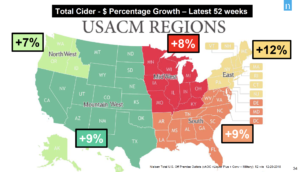 All 5 of USACM’s geographical regions experienced positive growth in cider sales for 2018 (off-premise). Regional and local cider retail sales increased 23% in 2018 (local craft beer increased 9.3% in 2018). 23 brands exceed the $1MM retail sales mark AND had double digit gains in 2018. Regional/local cider is now 1/3 of cider retail sales. Off the top 25 cider brands, 17 of them are regional or local brands. Cider’s total sales rely more heavily on on-premise sales that the other sectors, which are all about 50/50 on/off-premise. On-Premise retail sales were down across the board for cider: draft/packaged, national/regional. Some growth was seen for citrus, stone fruit and fruit-combo flavored ciders. Cider drinkers visit on-premise establishments more often than beer drinkers, and cider drinkers spend more money. Nearly a quarter of cocktail drinkers age 21-34 report drinking cider cocktails. Nielsen closed with this challenge: What If Cider’s Share of Beer in U.S. increases by 1 point? U.S. Cider sales would increase +65%, (over $800MM more than today). Contact speaker Danny Brager (danny.brager@nielsen.com) with your questions or to submit your labels for their database. As a USACM membership benefit, detailed Q1-Q3 on- and off-premise reports are available for just $50 per quarter. Contact Ellen@ciderassociation.org if you’d like to purchase any of these today. Q4 will be available shortly, to be followed by our annual report on the cider market.